This isn't new but it sure is good! Amanda does Marilyn + Cazwell. I have been a fan of Cazwell for a long time now. My friend Mikey burned a song that Cazwell did with Avenue D on a CD yeeeeeears ago and since then I've been a fan of his music. It doesn't hurt that he's not bad to look at either - in a dirty kinda way. He's very New York - slightly very naughty - gay - humorous and totally fun. 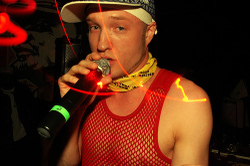 Cazwell is a young white rapper and artist who I think is super duper rad. He has a hot new video out (Thanks Andy!) that is worth checking out. It's not as fun as All over my face but it's up there. The new song is called Watch my Mouth and features the always fabulous Amanda Lapore. It's luscious and lovely. xox.